For example, let’s say I want to buy a lawn mower, and I don’t know what brand. 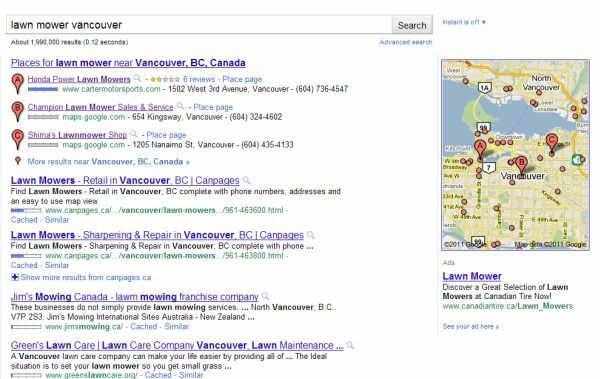 I could search for lawn mower vancouver. Hmm, three results in local search, and a bunch of listings that seem to want to mow my lawn, but not sell me lawn mowers. Only the 10th result in the organic (natural) search results even mentions lawn mower sales. The paid ads remind me that Canadian Tire sells lawn mowers. Looks like this would be a good town to sell lawn mowers in. Ok, let’s look closer at the local search results (the pushpins on the map in the image). The first claims they offer Honda Power Lawn Mowers, and takes me to a page full of motorcycles. There are a few atvs, even a snowblower, but no hint of a lawnmower in any link, or any menu item. In spite of their first place placement on Google, I’m what’s called a bounce. I’m outta there. I have utterly no interest in hanging around, trying to decipher if they have lawn mowers to sell me. The second local search result has no webpage. The Google Maps listing I’m taken to is scanty. There’s no hours, no list of brands, no welcoming text. A teeny picture seems to indicate that this is a retail store, but it’s not an attractive picture. On to number three, I guess – which is pretty similar to number two. A tiny, bad picture. An address. A phone number. Well, what about that last-in-organic-search result? Nope, it’s a directory, not a place to buy lawnmowers. And while they’ll give me a list and I can start this frustrating process over, forget it. At this point any sane buyer is on the way to Canadian Tire, since nobody else in this TWO MILLION PLUS population area seems to want to sell lawnmowers. Ok, sure, traditional businesses are moving a bit slow. They still do things the way they used to, even if that means spending large amounts on phone book advertising that doesn’t work on an increasingly internet-focused generation. And perhaps my parents, shopping for a lawn mower, wouldn’t look on the web, but they’re in their seventies. There’s no significant purchase I make without checking the web. In case you think I struggled to find this example, sadly, I didn’t. I picked the first thing that came to mind, and since “buy a new lawn mower” had crossed my mind earlier today, I used that. I did precisely one search, and wrote about the results. I’d hope I’d do better with “newer” products like laptops or cell phones, but even there, sometimes the marketing, particularly the local marketing, is just plain bad. So if you sell a product or a service, go check on what your potential customers find when they look for it. Then make it easy for them to find and choose yours. 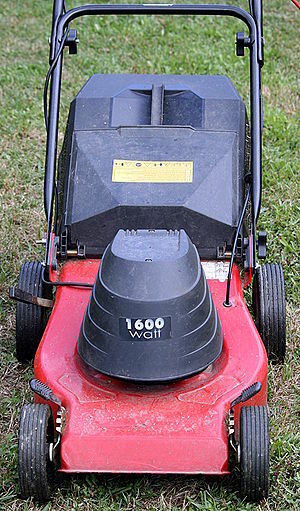 If you do have a little competition, well, either start selling lawn mowers in Vancouver, or sign up for a free introductory marketing consultation and we’ll make a plan to get you noticed. Why is it important in selling people buy in small businesses? Selling any product is not always been easy to everyone, but if you know some of the techniques, then you might probably know what to market. As consumers, interesting products can be a good way to sell in the market. 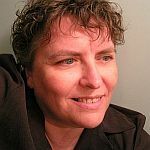 I think that this blog looks really helpful for business ideas.I’ll be looking at your “Why I unfollowed 855 people on Twitter” post next!